In addition to our exclusive interview with Nick Castle (read it here) at last month’s Mad Monster Party in Charlotte, North Carolina, Castle also took part in a Q&A at the event, during which he discussed more details about the new Halloween movie, revealing that we can expect numerous Easter egg references to the franchise and explaining that this new film was definitely made with the fans in mind. 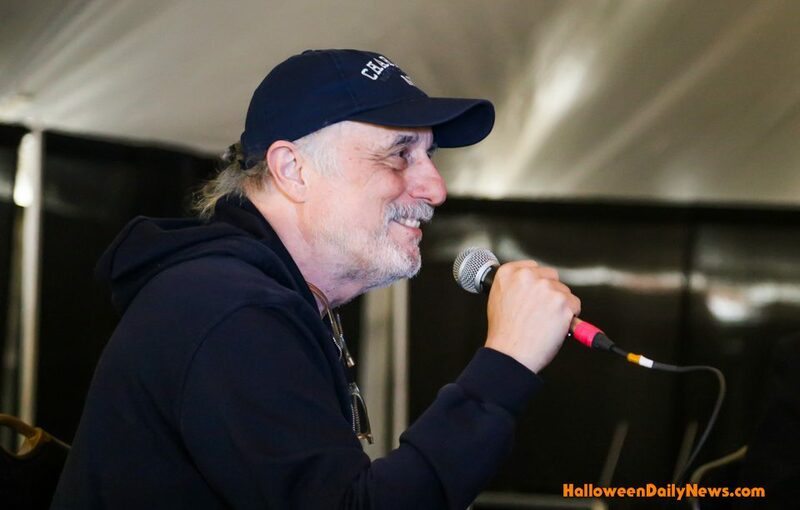 Be sure to check out our interview first, and then read on for some of the highlights from Nick Castle’s Q&A in which Halloween 2018 was discussed. To be back in this franchise that I never thought I’d actually do any more work, because I never really considered myself an actor, and if you’d ever seen me try to act without a mask on, you would agree, so to go back and relive some of this is quite fun. To see Jamie Lee Curtis again, in uniform, so to speak, was fun. This new group of filmmakers that’s working on it, I think everyone is going to be pleasantly surprised – I mean not necessarily surprised, because they’re very talented to begin with. I think they honor the tradition of the original movie. I have high hopes for it, and I think everyone who is a fan, of the original especially, should look forward to it. The first day on set, I got there and I was just walking to the wardrobe trailer, and I hear this screech, and she goes, ‘Castle!’ (laughs) And it’s Jamie, way across the lot with David Gordon Green. She’s just like, ‘Is this crazy or what?’ and she gave me a hug. So it was fantastic. It was pretty crazy. It was. Not so much when I did it in the makeup trailer, but when I put it on for a shot, the first shot that I was in, I went, ‘Oh my God, I’m doing this.’ (laughs) It was really pretty fun. You know, I’m 70 years old now. (laughs) I’m happily retired, so doing it was fun. But I quickly realized how much the fans really enjoyed the idea of having me back to be part of this in some way or another. So that was really nice to hear. I really appreciated what I heard from social media and stuff like that, and then also noticing how the press picked up on that when it was announced. I thought that was kind of cool that people remember my work I did on that. And I get a lot of love from everybody here (at Mad Monster Party), and I return it because I appreciate it. Yes, the set photographer and I decided let’s do some then and now photos. So we did that one, we did, we did me doing this (tilts head), we did an over the banister one. We did a few things like that. We thought it would be fun for the fans, eventually when we can show the mask. There are so many Easter eggs in this movie. This first day I was there, they were shooting a scene in a classroom, and David said, ‘Do you see anything on the chalkboard?’ I said, ‘No.’ He said, ‘Look there,’ and (on the chalkboard) it’s the line that P.J. Soles says all the time – totally. There are things like that throughout the whole thing. I don’t think it’s giving anything away to tell you that there is another (actor portraying The) Shape here, Jim Courtney. Let’s put it this way, there is a lot of physicality in this film, (so) you need someone that had not only acting ability to play The Shape but also stunt work. You’ll want to talk to him when this is all said and done. He’s going to be another member of this extended family that you’re going to love. He’s a wonderful guy. It’s not a secret when this one starts. It starts 40 years later, and at this point the Dr. Loomis character has passed away. But there is a new, in a sense, character that takes over that kind of position, and the storyline will explain his relationship. (He’s) a tremendous actor out of Turkey (Haluk Bilginer, who plays “Sartain”). I make sure I don’t eat too much three weeks before. (laughs) Someone, and I’m not blaming any of you here, when they heard I might be playing The Shape, said, ‘I don’t know if I’m going to be scared by a 70 year old man with a pot belly walking around with a knife.’ (laughs) And I took that to heart. Getting into shape for The Shape, I actually made sure I was in physical condition to do anything, because just lately I’ve had some physical problems and I had to admit to that. I wasn’t going to hold up the production of this movie on the basis of that. But as far as psychologically or acting-wise, (I did) very little (to get into character). From my standpoint, I looked at me as being a puppet for the director’s needs. Now Jim (Courtney), like I said who’s doing this work too, has a whole different take on it and really wanted, he said, to channel what he saw in the original. So even in that regard, there’s a lot of respect for the original. I think it’s really about how can we not only respect the original, but how can we enjoin the fans to enjoy it like it was before. They want you to be proud of this movie. They really do. They really want you to be proud of this movie and really enjoy it, and that will make them happy. You can read our full one-on-one interview with Nick Castle here.